I’m a bit behind on sharing the mittens of the month from Kat at Just Crafty Enough, but this month’s pattern is pretty even if it’s past St. Patrick’s Day. The Newgrange Mittens were inspired by spirals found on Newgrange at Brú na Bóinne, a monument dating from 3200 BC. 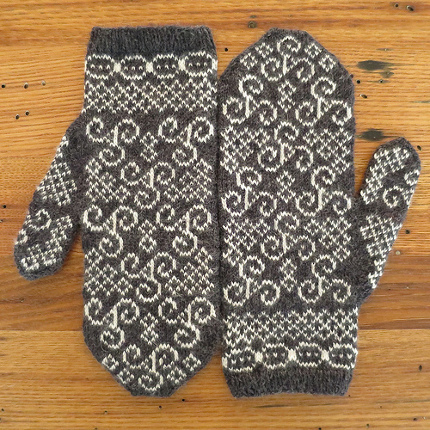 But the pretty spirals on the mittens don’t look like they’re for any sort of holiday, so you can wear these mittens any time you like. They’re worked in two colors using stranded knitting techniques and a chart, so they could be a great skill-building project for someone who hasn’t done color knitting or chart reading before. The bonus is the two layers of yarn that go into the mittens’ construction, making them extra warm.